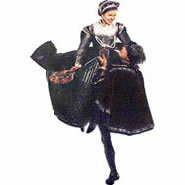 A Renaissance Revel, Archival Dance – Performance Video of Period Dances. Reconstructions Include the So Ben Mi Chi Ha Buon Tempo, Il Canario, Spagnoletta, Gagliarda, Bouffons, and More. This archival video from 1992, intended for research purposes, features a performance by Carol Téten’s Dance Through Time company. The dancers perform the So Ben Mi Chi Ha Buon Tempo, Il Canario, Spagnoletta, Gagliarda, and Bouffons and more in period costume. The performance draws from years of research from original sources and archives. The performance draws from years of research from original sources and archives. This is an archival performance video, available for research purposes only. For broader information, see Dancetime DVD! Volume I, How To Dance Through Time!, and America Dances!